TebastTM is indicated for the symptomatic treatment of: seasonal and perennial allergic rhinitis, chronic idiopathic urticaria and allergic skin disorders. Tablet: Adults (more than 12 years of age): 10 mg (one tablet) once daily, Children (6-12 years of age): 5 mg (half tablet) once daily. Syrup: Children (2-5 years of age): 2.5 ml once daily (upto 5 ml in severe cases such as perennial allergic rhinitis).Children (6-12 years of age): 5 ml once daily (upto 10 ml in severe cases such as perennial allergic rhinitis). 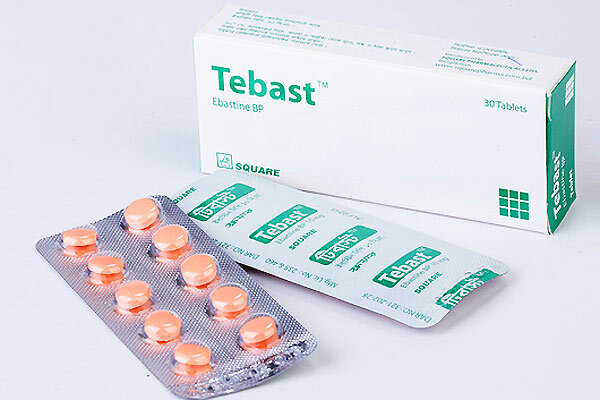 TebastTM tablet or syrup can be taken with or without food. TebastTM Tablet: Each box contains 30 tablets.